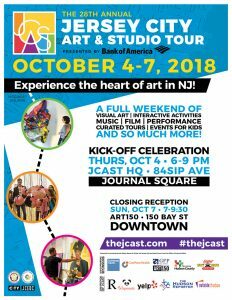 The Jersey City Artists’ Studio Tour is a two-day walking tour of artists’ studios, group exhibitions, and art in public spaces. From 1994 to 2013, Pro Arts cosponsored this annual event with the Jersey City Division of Cultural Affairs and corporate sponsors. Attracting more than 2,000 visitors every year, it is the main cultural event of the October Is Art Month celebration. Since 2014 Pro Arts is no longer a sponsor of this event but continues in its long history of participation through organization and sponsorship of major JCAST exhibitions. This year Pro Arts presents the work of SIXTY artists across TWO venues and ONE cross-disciplinary collaboration! Our goal of $1,000 will help defray the cost of both Pro Arts shows. YOU CAN HELP MAKE THIS HAPPEN! To make a gift of any amount click on the DONATE button.